Motor vehicles and their components are subject to many complex but necessary safety standards, and tyres are no exception. The Australian Design Rules (ADR) specify several important requirements relating to passenger vehicle tyres and wheels, and there are separate regulations in place for trucks and construction vehicles. ADR 23 stipulates that all cars are required to be fitted with a label or a placard that clearly documents the correct tyre specifications (size, capacity rating, speed rating, and suggested inflation pressure), as per the manufacturer’s requirements. This has been in place since 1973. ADR 23 doesn’t specify what construction style the tyres must be, which means that older styles of tyre can still be sold and fitted. However, there are performance standards which must still be met, including heat resistance, endurance, strength, and high speed stability. 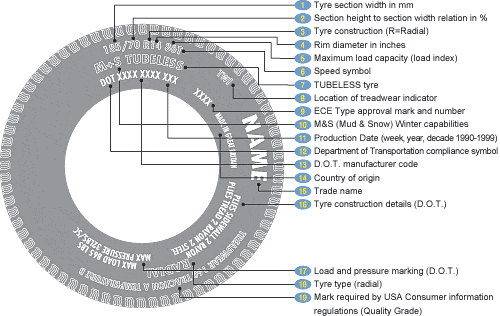 Furthermore, tyres must have their specifications (size, construction type, speed rating, load rating and date of manufacture) clearly printed on the sidewall, as well as an arrow showing the direction of fitment (for asymmetrical tyres) and a minimum of four equally spaced tyre tread wear indicators. These are designed to show when there is 1.6mm or less tread remaining (this is the point at which a tyre is deemed to no longer be roadworthy). Aftermarket or replacement wheels and tyres fitted to passenger vehicles must not be more than 15mm larger or smaller than the largest and smallest tyre sizes respectively listed on the placard. The other specifications (for example, load rating and speed rating) on the placard are also required to be followed strictly when replacing the tyres that were sold with the car when it was new. Other standards require tyres that are fitted to the same axle to be of the same carcass construction and of an identical size as the original tyre. The wheel track (the distance along the axle between the centre line of the opposing tyres) is another measurement that must be followed, with specific standards specifying the maximum allowable track for replacement or aftermarket wheels. The aftermarket standards for wheels and rims are quite in depth, as this is a common modification area for cars and can cause safety issues. Aftermarket wheels must have the same stud pattern and spacing as the factory fitted wheels, and new spacers are not permitted to be installed to make wheels wider. Sometimes, fitting wheels and tyres that are different to those that initially came with the car requires work to be done to the brake calipers and brake discs to ensure that they fit properly. However, modifications to these components is not allowed under the standards unless a specific engineering certificate has been obtained to do so. These standards exist to ensure that passenger vehicles meet a minimum level of safety, and that they continue to do so even after wheels and, inevitably, the tyres are replaced. The most important thing for motorists to do is to ensure that you take particular note of your car’s tyre placard (usually located in the glovebox or in the driver’s door sill). If, however, you are ever in doubt about what you can or can’t do, always ask a tyre professional to help determine whether your vehicle and its tyres are compliant with the Australian Standards. You should always also check with them that any tyres they recommend for your vehicle are in line with Australian standards regarding the size of your vehicle and the wheel track requirements.